Home / Basketball / Villanova Makes Big East History!! The Villanova Wildcats and the Seton Hall Pirates went through a lot to make it to the Big East Championship Finals. The Nova Pirates survived and overtime thriller against Xavier, which came down to the wire. After an emotional and controversial game between Seton Hall and Marquette, which ended in multiple ejections. The Seton Hall Pirates came out bruised, but victorious. Tonight they come to a head, as the Pirates look to dethrone the reigning champs, while Villanova looks to get their 3rd straight Big East Championship. As Myles Powell knocks down a long trey on the wing to start the game, the energy in the arena took off. Each team began to show us why they made it to the finals; and the night wouldn’t get any easier. Senior, Phil Booth has led the Wildcats all season along side Eric Paschall, each player has instilled in their young roster a sense of passion and that was brought to the floor tonight. But Myles Powell, who has shown his heart throughout each round, would rally the Pirates to not give up, and that is what they did down to the last second. Seton Hall closed the first half with just a 2-point lead, 28-26. Both teams made offensive strides, but defensively they put pressure on the ball. Phil Booth struggled offensively in the first half, but both teams became fiery in the second. 2nd opportunity shots, and key plays helped both teams score 46 points in the 2nd half, but it would not be enough for the Seton Hall Pirates to take down the reigning champs. Villanova secured their win and Phil Booth grabbed the defensive rebound and cheered on the court as the clock expired. 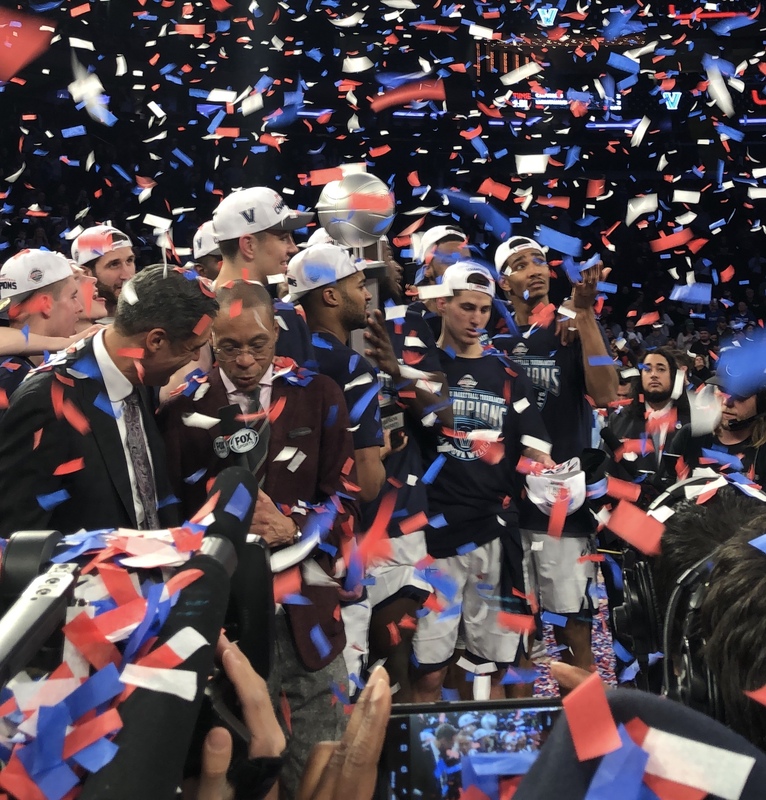 The Wildcats were now champions for a third time in a row, and punched their ticket for the madness. Some questioned their toughness, but now the question has been answered. They’re Big East Champions, once more.